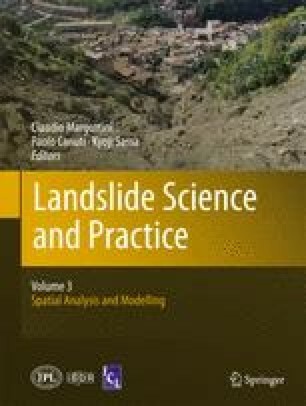 This paper focuses on the quantitative investigations carried out to evaluate stability conditions of the northern flank of the La Fossa cone (Vulcano Island) and the consequent runout of the debris avalanche that would be generated by a possible failure. The contribution describes first the geological setting and the typical instability phenomena of the area. Then it illustrates how the global morphology of the flank was reconstructed by combining aerial photogrammetry and high resolution 3D surveying techniques such as terrestrial laser scanner. The resulting digital elevation model (DEM) permitted us to extract and measure structural and morphological elements that drive and influence past and potential instabilities. These elements were used to constrain limit equilibrium analyses (LE) that were used to estimate the volume of soil mass susceptible of failure. Strength parameters at large scale were obtained from laboratory tests, described in previous studies, and back analyses of a past failure whose geometry was reconstructed from the DEM. Finally, results of runout analyses of the debris avalanche are presented and discussed. Analyses were conducted by using DAN-W and DAN-3D codes which allowed an estimate of the maximum runout distance and extension of the accumulation zone with respect to the inhabited area.